Keto Coleslaw Recipe is Very low-carb and Paleo friendly too! Our Keto Coleslaw is a low-carb, creamy, tangy and colorful side dish. 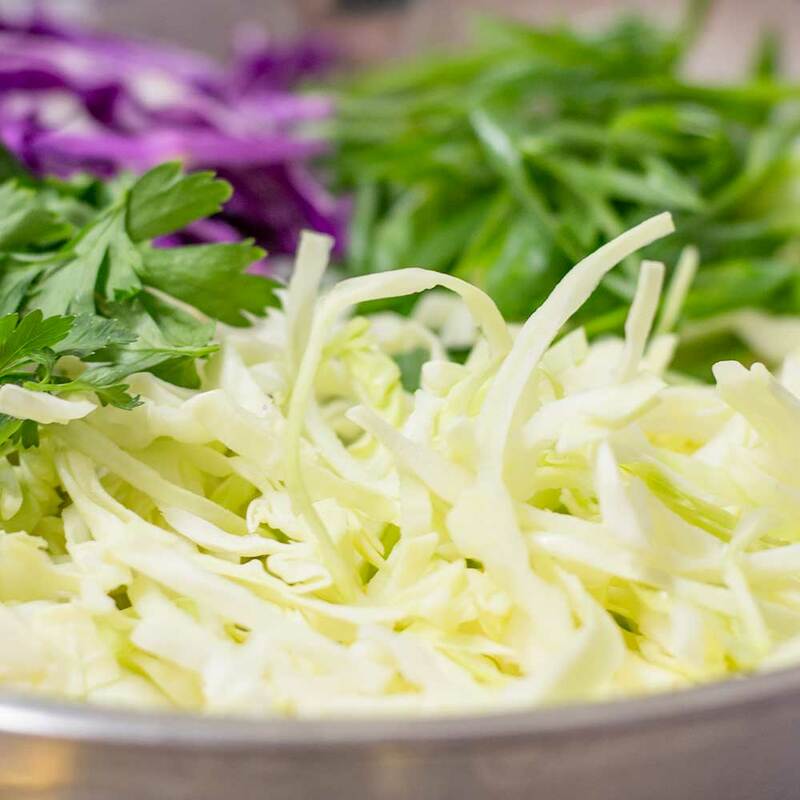 This classic cabbage salad is a staple recipe for BBQ and other high-fat meat dishes that everyone can enjoy! This recipe is suitable as a paleo coleslaw also. Coleslaw is a dish that can be found at most barbecues, potlucks, and parties. We like to serve low-carb coleslaw with our Keto Fried Chicken and Beef Schnitzels. 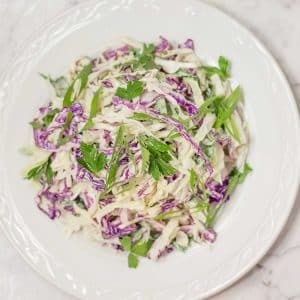 This creamy Keto Coleslaw recipe makes 8 side serves. 1 serving is ½ a cup or 70g/2.5oz. 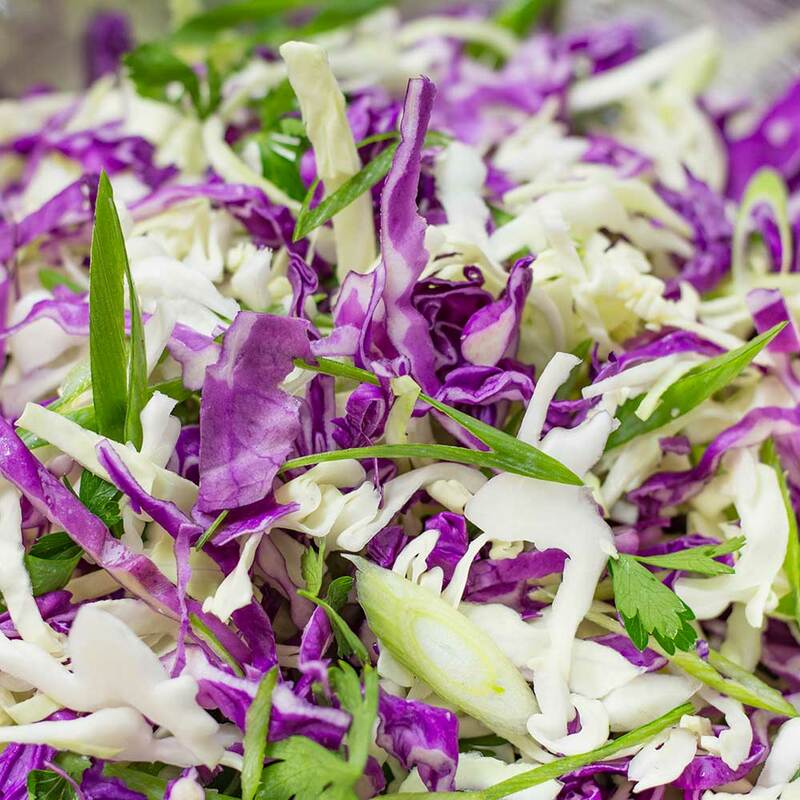 We recommend eating this keto coleslaw fresh, while the cabbage is nice and crunchy. It can be stored in the fridge for up to 2 days, keep in mind the cabbage will soften when stored with the low-carb salad dressing added. Keto Coleslaw is very easy with readily available low-carb ingredients. In a large mixing bowl, add the cabbages, scallions, and parsley and toss together. Set aside while you make the dressing. In a small bowl, add the remaining ingredients and whisk together until smooth. Pour half the dressing into the salad and mix well. Continue to add the dressing until the salad reaches your desired level of dressing (we like to add it all). Taste your coleslaw and season with additional salt and pepper if desired. 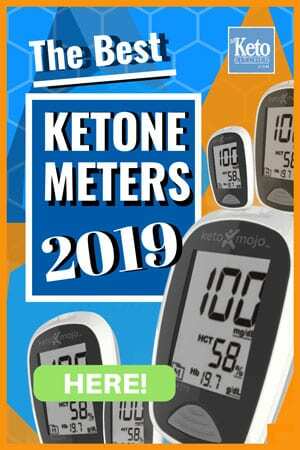 Make your keto coleslaw as a tasty side dish to low-carb meat recipes, grills and BBQ. 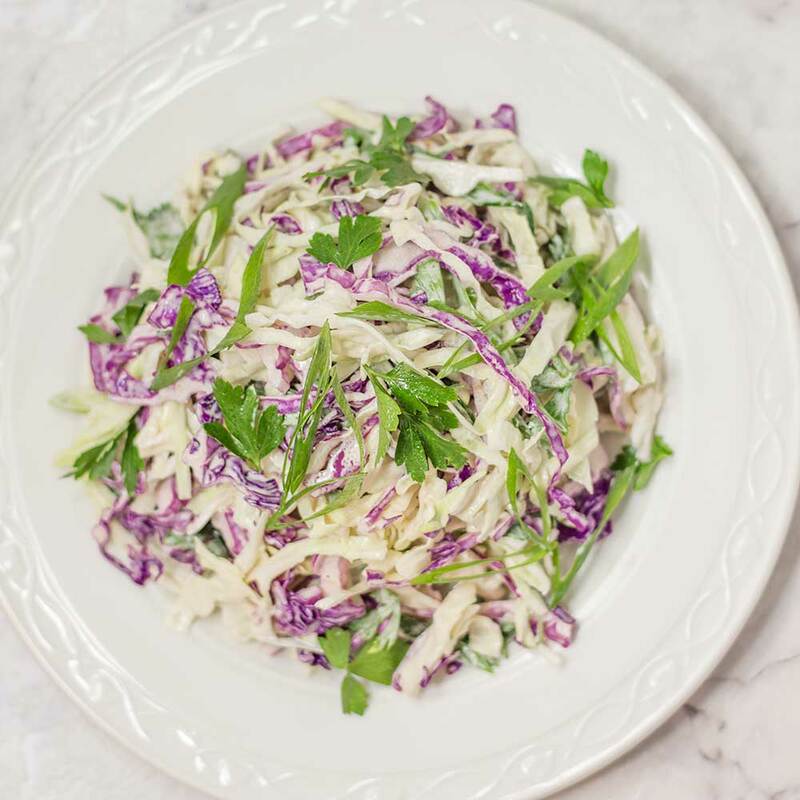 Our Keto Coleslaw is a creamy, tangy and colorful side dish. This classic cabbage salad is a staple recipe that everyone can enjoy! Coleslaw is normally high carb due to the cheap mayonnaise and dressing ingredients used containing sugar for taste. Our Keto Coleslaw, however, is made with whole egg mayonnaise has a good dose of healthy fats and is very low-carb. 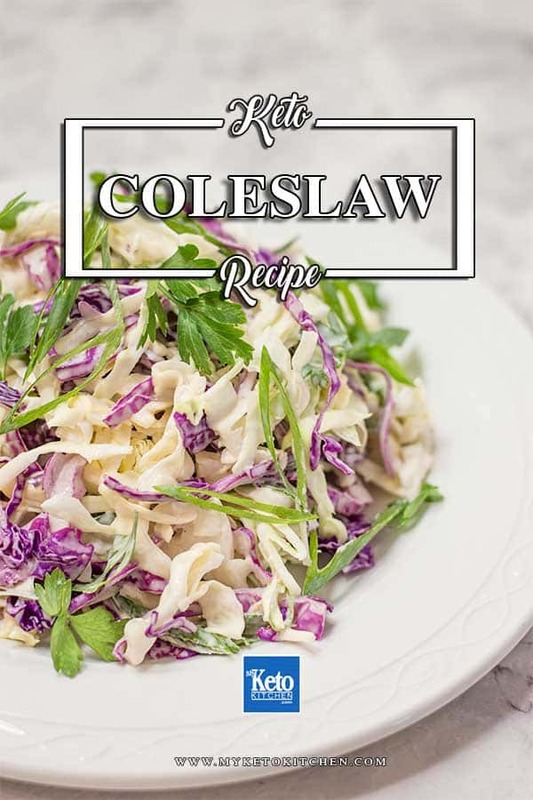 To make a larger batch of this Keto Coleslaw recipe adjust the servings above.